Soft, trim and absorbent. 100% cotton muslin prefolds. A pack of 6 white size 1 - Newborn prefold nappies. 11x14 inches 4-6-4 layer. 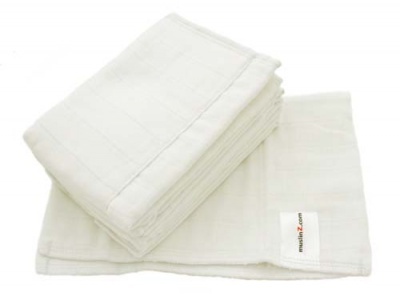 Just perfect as a new born nappy and so easy to use with no need to fold. Small and very trim. Can also be used as an insert in a newborn cover and later as a booster or in a trainer pant for extra protection. Wash a couple of times before use - 40c.